Popeye, also called exophthalmia is a symptom, not a disease in itself and has many possible causes. Popeye is characteristically diagnosed by the swelling or protrusion of one or both eyes. Curing popeye can be difficult if the source is unknown. The origin can range from bacterial, viral, parasitic or as an effect of fish tuberculosis. It’s often impossible to determine which has infected a given fish. Answers may lie in other symptoms. When you first notice popeye it’s best to observe your sick fish and other tankmates for other signs of disease that may offer a clue. For example, if the popeye is accompanied by redness under the scales you may deduce that the source is bacterial. There is no sure way to determine the cause and your best guess may be all you have. 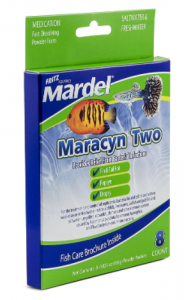 Generally when the origin is unknown aquarists begin by treating with a broad-spectrum antibiotic like Tetracycline or a combination of gram-positive and gram-negative antibiotics like Mardel’s Maracyn or Melafix Bacterial Remedy that contain Erythromycin and Minocycline respectively. Exophthalmia itself is not contagious but the infection that caused it may be so it’s best to treat any sick fish in a hospital tank away from other healthy tankmates. The original infection is most commonly caused by poor water quality and measure to improve the tank water should be taken immediately. Poor water quality does is not usually obvious to the naked eye. Your water may seem to be clean in appearance but there could be toxins present like ammonia, nitrite and elevated nitrate levels. The only way to determine the presence of these toxins is to test with the appropriate water test kits. Other stressors may have contributed to the infection like fluctuating temperature or pH or harassment from other tankmates. To avoid diseases like popeye, keep up with your water changes, frequently test your water and never introduce new fish to the tank without first quarantining them in a separate tank for 3 – 4 weeks before exposing them to healthy fish. The lasting effects of popeye vary from a full recovery to cloudy, swollen or even a missing eye. It’s not believed that these effects inhibit the quality of life for the fish. Even in the case of a missing eye, the fish can live a full and normal life. If your fish looses his eye be sure to keep your water very clean to avoid any further infection while the socket is healing. Antibiotic resistance is a problem facing aquarists all over the world. This occurs when bacteria evolve to make newer, stronger strains that cannot be combated by available antibiotics. To avoid creating tougher strains of bacteria be sure to carefully follow the directions on the medicine package and to never stop or change medications part way through treatment unless your betta is having a dangerous reaction to them. As with any disease, remove your sick fishfrom the community tank and isolate him for treatment in a hospital tank. Never medicate healthy fish. Thanks Christie happy reading your article but I’ve a pair of Blue veiled angels, a year old, one of which has a slight bulge on his left eye. they are both beautiful though ….. there seems to be no visible marks bloody spots or even any markings of an infection. i love my fish so much… i usually don’t regularly change water but top it up with fresh water. therefore i now realise that i need to change water atleast 20% of my 25 gallon tank. I have a beta thats just over a year old (to the sellers best guess) A few days ago I noticed a small patch of scales above his left eye that seemed to be lighter than the rest. It was almost time for me to do a water change so I did one immediately hoping that the problem would correct itself. It hasn’t and now there seems to be a slight bulge on his left eye. He is somewhat more lethargic than usual but still pretty active for the most part. Does this sound like it could be popeye, or something else? What should I do? PLEASE HELP!! If the eye is bulging, then it probably is Popeye. The discolored scales is unusual and doesn’t sound alike a symptom of Popeye, that I know of. Have you tested the water to see if there is anything environmental that may be bothering him? I spoke with my local tropical fish store owner I explained in more detail all of Fin’s symptoms, he said to him it sounded like a bacterial infection. I purchased the food to treat a bacterial infection he also suggested that I use about 1 teaspoon per gallon. Before I did as he suggested with the salt I did some research and everything I read supported his suggestions. I did as he suggested and Fin seems to be doing better already, however I did have some questions about the salt treatment. How often do you add the salt, and does it just filter out? Thanks sooo much for all your help! Salt does not filter out of water. The only way it can be removed is to do a water change. If you continue to redose without first removing the old water, it will accumulate and could become a health hazard for your fish. How do you know if both of their eyes have them? Is it possible for the popeye to go away on it’s own, once the environmental problems are alleviated (if that is the cause)? I just rescued another male and his selling cup conditions were very poor, which I’m thinking maybe be the cause. I have now introduced him to a balanced tank. Do you think I should wait a day or two before treating him with the medications? Thanks. 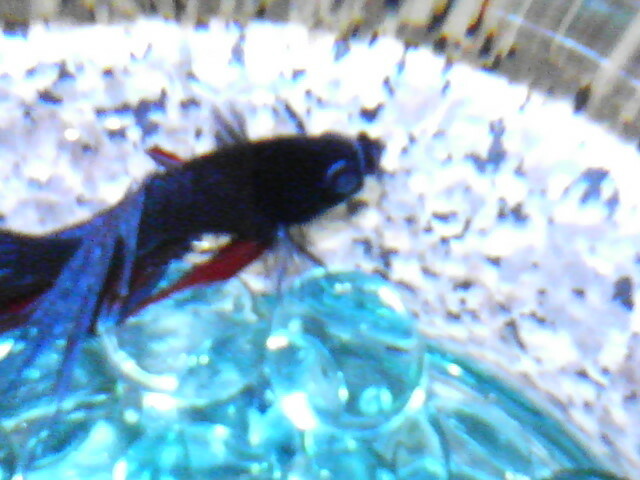 I bought a Betta Fish on October 22 ,2011 and I think my betta fish Goldie is sick. The first 3 weeks, he was beautiful, healthy, and he eats his food. But around these 2,3 or 4 days he lies in the bottom of the tank and do nothing. Well I do know he is alive because his gills are moving. Every once in a while I would lift his bowl up and he would go to the surface and come back down. Another problem is that his tails are closed! He stills eat though. Please help me and reply. You can tell me what to do with Goldie and what kind of disease he has. My betta has popeye, and has had it for a few months. We’ve tried a few different treatments, but nothing has worked. Now, part of his underside is bloated. It looks too far forward to be his belly, it’s right behind his head. I have no idea what’s going on. Help please? I’m getting so desperate. overfeeding. If he is not pooping, cook a frozen pea until cooked. Cool completely, and pinch off all the pea skin. Break it into pieces, and feed to betta. If he eats it, then watch and see what happens. This can help their tummies. If any pea is left over after 24 hours, remove it or it will foul their water. Good luck! Oh sorry! I didn’t see how old your message was! How did your betta fare? If you ever see those symptoms again of swollen tummy/funny swimming, try the above advice. My sister decided that keeping up with her Betta (Squirmy) was too much work, so I took him off her hands. In the few months I have had him he developed Popeye. I purchased Mela-Fix and gave him the proper dosage for about 3 weeks. His eyes look normal, but now instead of red and blue he has turned red and grey. I change his water once a week. He lives in a fish bowl, but was moved from a 1.5 gallon tank about a week ago. Should I be worried? Does he need more medicine? I’ve had my betta for a couple of years now and just did a water change 2 weeks ago. She has never had a problem with popeye before but she sure has it now. I’m currently treating her with Maracyn-Two, but should I have used tetracycline? I’m not sure how she ended up getting it in the first place. The only thing I can come up with is perhaps the water is too cold? We had a warm spell here for while and I took the heater out. Now my fish is horribly ill… I’m putting the heater back in now. I’m triying to figure out what’s wrong with my betta. His eye looks white and puffy. His belly is hollow. He eats bitnot a lot. He is still very active. I wanted to give him a community. But I don’t want to get the other fish sick too. I rescued my betta from walmart 10 weeks ago. He grew big and beautiful.I change his water once a week with bottled aqua culture betta pro water. He now has pop-eye. I think this might have happened from a temperature change.Questions:why does temperature cause sickness?I am treating with Maracyn two,which is minocyline for 5 days.Eyes still poped out can I try Maracyn Erythromcyne? Help.Which is better to treat pop eye, Maracyn which is Erythromycin or Maracyn two which is minocyline? Can you switch from one to the other if one doesn’t seem to work with a water change? Our betta fish ended up with popeye, searched the internet, found it to be popeye, cleaned out the tank and hoped for the best, after a long recovery, Goldie has lost his eye but is doing great. Little trooper for sure. Glad to hear that a betta can live a full and normal life. Thank you, your site is great!!! How do you get the meds for Popeye??? My betta fish Apollo has one eye protruding from the side of his head. His eye looks the same other than it sticks out. He eats just as much as he did before, he swim arounds and he makes bubble nests. He is just as active before he got pop-eye. I’ve been giving him Melafix for the past few days just in case it gets worse, but he doesn’t have any traditional symptoms of pop-eye. Maybe I already treated it and his eye is just stuck that way? My beta is about three years old, and I just noticed that both of his eyes potrude out like they do in the picture you showed. He has been like that for the two year I’ve had him, and it hasn’t affected his health; He still eats like a pig, and swims around happily. Do you think it is popeye? What should I do about it? Oh, and he has an African Dwarf Frog in his tank with him. The water is kept at about 80 degree F, the lights are on for twelve hours a day, and he gets weekly water changes. HELP!!!!!!!! What am I doing wrong? Hello. I am a longtime owner of betta fish, yet I don’t know what to do for one of them. I just bought him from Petco a couple days ago, and now it looks like he has popeye! But he is in a betta bowl not a huge aquarium and so all the fish treatments seem to be measured for 10 gallon aquariums only! Are there drops I can use for a betta bowl? Or should I just make sure his water is super clean & wait and see? Help! I usually just scrape off a very small portion of the tablet. We Have Had 4 Betta’s over the last 5 years & have had Medical Problems with EVERY one of them..Ick & Calimaris(Not True Fungal) Fin Rot ,Some Had Constipation ,But We kept on top of that with Feeding Aquion Brand (Smaller pellets ) & Some times a Piece of PEA. We have kept them in a 2 Gal Tank with a Heater ,Filter,& Now a Mini Sterilizer ..We take His Poop out of the tank Right away (With Turkey baster) We add New water & the Tank is Very Clean !! Our latest Boy “Ruby” Now has Fin Rot & SUDDENLY lost a large piece of Fin !!! (Hes Not Nipping ) I have come to believe Many Of these Bettas Our Breed So fast that MOST come with diseases . Ruby had a tiny amount of ICK ,But we cured it with NOX-ICK(Malecite Green) Now We Have a NEW Problem ! !I guess we have to treat him with a Gram Neg Antibiotic ..I wish there was a local Breeder Because No mater What Store We get them from They have Lots of Problems!!! Hello! I just recently rehomed my second Betta fish, and he has very severe fin rot and pop eye. My first rehome had very severe fin rot but I was able to treat it without any problem, so I’m not worried about that aspect of treating the new one. However, I do have some questions about the pop eye. Both are popped out the same amount and one is cloudy so his depth perception is a bit off. He’s still interested in food and I finally saw him eat tonight while I was watching. He’s also very energetic. I was wondering how long it generally takes for pop eye to start improving and if his eye will always be cloudy on that one side. Also, he came from terrible conditions in a 1.5 gallon box. He’s now in a 5.5 gallon tank like my other one with a filter, a heater, and very clean water. I’m treating with Jungle Fungus Clear tabs which worked wonderfully on my other guy (who now has the most beautiful flowing fins you’ve ever seen). Can you provide any insight? Thanks! I’ve recently come back from a vacation only to find all but two betta alive. The person that I’ve gotten to feed and change their water didn’t do his job, and one of the remaining betta has popeye. I was wondering if Tetra Fungus Guard would work the same as Maracyn+Maracyn Two? Also the other betta has swim bladder and appears to be blind, as he won’t eat even though he is starving, and he doesn’t react when I wave my finger in front of him (responds to vibrations though). My dad thought maybe it is because of the ammonia in the water but does anyone think it’s something else? And how do I get the poor guy to eat? Hi there, I’m new here and concerned about my betta. They’ve had some eye cloudiness and swelling for some time now. I’ve treated the water with conditioner and other water decontaminates and consistently test the water quality, but everything comes out normal. I change water as I normally do, being sure to treat it and let it sit for 24 hours as I was told when I bought her. I’ve even been trying to use medicine for fungal infections as per recommendation from a pet store (dosing has been a bit frustrating due to having to change the average 5ml for 10gal to dosage for 2.5gal). But nothing seems to be helping. The betta is still very active and responsive, she still eats but has been lethargic at the bottom of the tank. I’m worried that I’m not doing the best I can to take care of my little buddy. My fish Buddy has Popeye on one eye. When I discovered it I took him out of my 32 gal aquarium and put him in a .5 gal fish bowl( the hospital) and use a heating pad to keep his bowl temp at 77-78 degrees. At first I’ve been using Melafix and aquarium salt. It’s seemed to be working. Now I ordered Fish Mox which is Ampicillin. I’m hoping that will help. I just started treatment yesterday. I love my little buddy and I’ve spent so much money on different meds. The other prob is he hasn’t eaten anything for days. That’s worrying me. I clean my tank every 2 to 3 weeks. I think he may of injured his eye. Any suggestions on getting him to at least eat? Hi, so I’m freaking out about my 1 year old fish, he has recently gotten pop eye, I got the antibiotic to treat it and I change her water. Which I do once a week! I have now noticed discoloration and a red scale hanging off his eye. It looks like blood. He does not eat and moves only when I approach his tank. Is my Betta dieing?? Please help! Any advice would be appreciated. My 4 year old son is devastated.